Anyone that’s involved with digital marketing will know that email marketing is one of the foundational pillars of the industry. As new social media platforms and marketing channels have emerged, email has remained one of the most profitable and widely used: the average ROI of email is $38 for every dollar spent. Heavy emphasis has been put on building email lists, and with good reason. Being able to market to your subscribers for next to no cost has tremendous advantages – and until recently, email enjoyed this advantage almost exclusively. But with Facebook Messenger bots, Messenger marketing works in a similar way. With Facebook Messenger marketing programs such as ManyChat you can build a list of “Messenger subscribers” that you can market to. 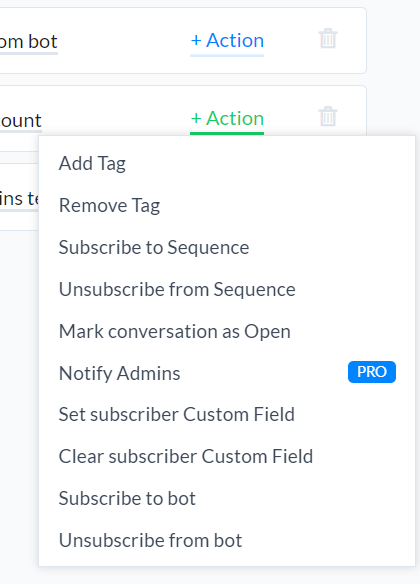 Just like with an email list, you can broadcast to these people and create autoresponder sequences that send scheduled messages after they subscribe. And, very importantly, you don’t need to pay each time you broadcast to your subscribers. There may not be much difference in the way these two marketing channels function, but I would argue that there’s a big difference in their effectiveness. At least right now. How Effective Is Facebook Messenger Marketing? Facebook Messenger marketing is fairly new, so unlike email, there’s a good chance that your competitors are not yet taking advantage of it (and this is the case for most industries). This means there is a lot less noise that your marketing messages must fight through to reach your customers. The average adult receives 147 emails per day, whereas the average adult probably receives somewhere between 0 and 1 Facebook Messenger messages per day. Of course, this is likely to change going forward as Messenger marketing becomes more popular, although it’s very unlikely that we’ll reach the same oversaturated situation that we have with email. Facebook oversees its Messenger platform and guards it closely. They do not want their users to be turned off the platform by spammy advertisers and they will take steps to prevent that happening. Facebook messages also have the advantage of really grabbing your subscribers’ attention. When you broadcast a message to your list, you can use regular push notifications, which means your message will pop up on your subscribers’ devices and even audibly notify them. This is huge and so far is being reflected in the data. That’s right. Messenger sees open rates of 80-90% and click-through rates of 20% (and sometimes as high as 50%! ), which means that Messenger marketing is about 10x more effective than email marketing. 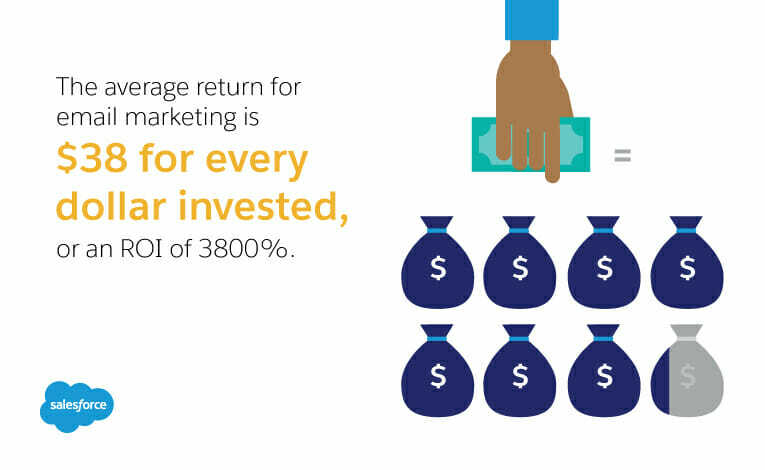 If you’re used to email marketing, you’ll know that those numbers are incredible! 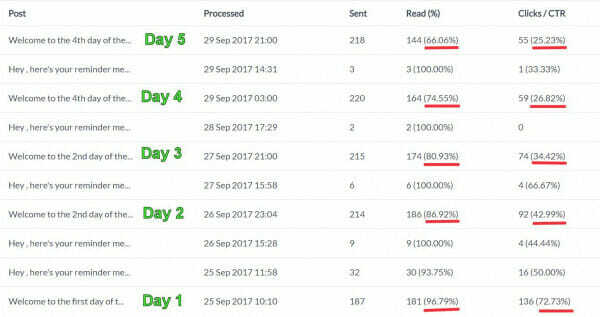 ManyChat reports that they see “open rates of 66.06-98.56% and click-through rates of 8.40-72.73%.” Most email marketers (me included) would love to have that high a percentage open their emails, let alone click on a link. Facebook Messenger marketing also has the added advantage of being a lot more personal. Most people use Facebook Messenger to communicate with friends and family, so when we receive a message, we’re very likely to both take a look and interact with that message. This article is not an attack on email marketing. It’s still very effective and will be key to many sales and lead generation funnels going forward. But by making the comparison, I hope you can see just how effective Facebook Messenger marketing can be. And why it’s well worth you investing some time and money into building a Messenger subscriber list. With that said, let’s get into the steps. The first thing you’ll need is a subscription to a Facebook Messenger marketing program like ManyChat. There are a number of alternatives, but ManyChat is the most popular and the one that I use. It’s also very affordable. To implement the strategy I’m about to demonstrate, a pro subscription, which costs just $10 per month, is all you’ll need to get started. How Does Someone Become a Messenger Subscriber? This is fairly straightforward. Someone becomes a messenger subscriber of yours when they send a message to your Facebook page. 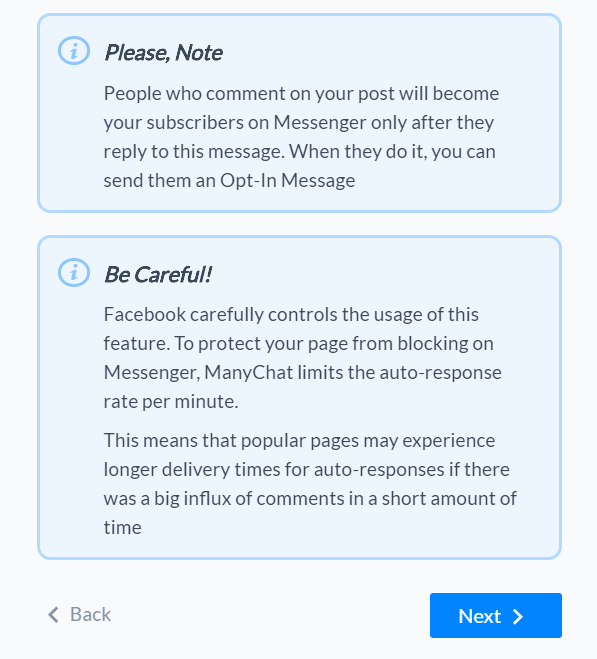 To receive broadcasts and be added to sequences (ManyChat’s equivalent of email autoresponders), someone must have sent you a message via Facebook Messenger. Replying to a message that you have sent them counts as well. Therefore, your goal is simple: to get people to send your Facebook page a message via Messenger. You can do that in a number of ways, including with Facebook Messenger Destination ads. 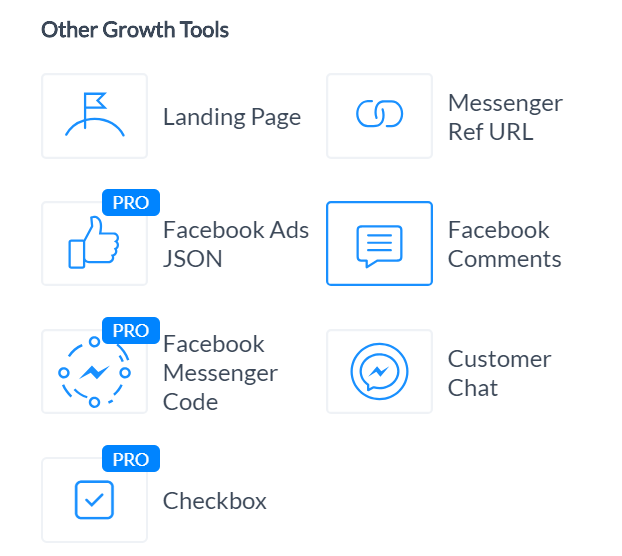 But my favorite strategy is to use a ManyChat growth tool called Facebook Comments. Ads that use this tool are commonly referred to as Comment-to-Messenger ads. Comment-to-Messenger ads, as the name suggests, start a conversation via Facebook Messenger with someone who comments on your ad. For example, you can state in your ad that if people comment below with the word “discount,” they will receive a message with a discount code that can be redeemed on your website. A message would then be sent to those people asking them to reply with the word “discount” in order to receive the code. As soon as they reply, they have become a Facebook Messenger subscriber. 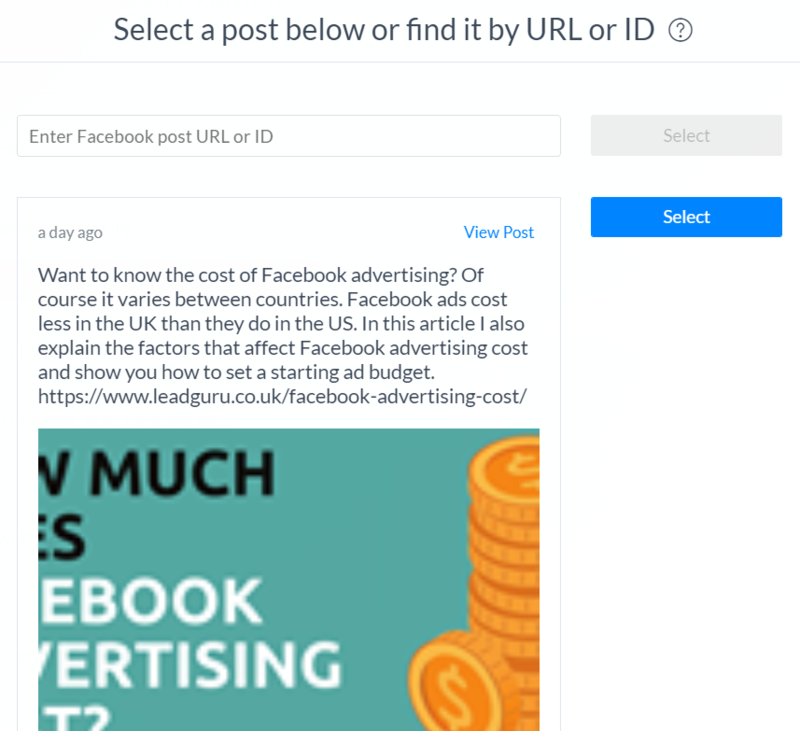 Select the post you want to use or enter your post URL or ID. As you can see, this feature works on ads and regular Facebook posts. In fact, I would recommend that your ad is a published post on your Facebook page. 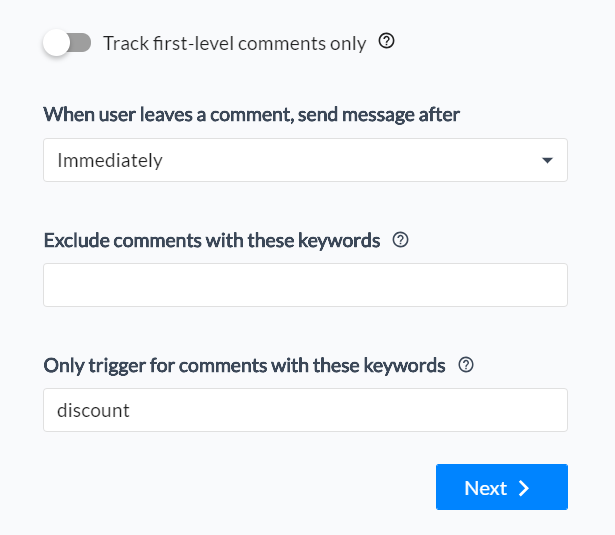 First you need to decide whether of not you want to Track first-level comments only. 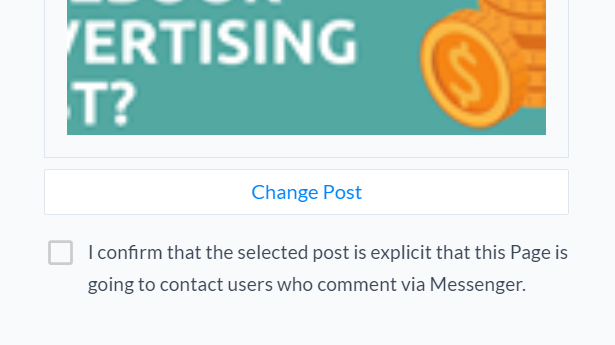 In other words, do you want to exclude people who only reply to comments from receiving a message. I would recommend leaving this disabled. Then you can choose how long it takes for someone to receive a message after they comment. There aren’t many scenarios where you would want to delay that message being sent, so select Immediately. 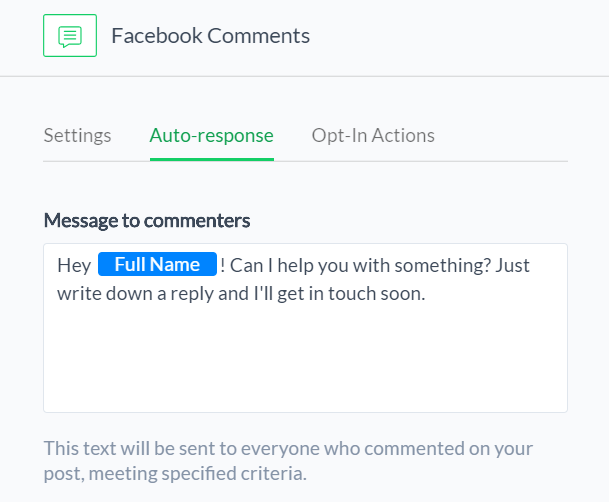 After that, you have the option to Exclude comments with these keywords. For the purposes of this demonstration I am going to leave this blank as I usually do. However, depending on your business you may want to add some words here. And finally, you can choose whether or not you want all comments to trigger a message, or Only trigger for comments with these keywords. Here, I would recommend that you do enter a keyword. That way you can specifically ask people to comment with a word that is relevant to what they’re going to receive in the message. In the example above I mentioned commenting with the word “discount” to receive a discount code. We’ve covered the first warning message already. The second is only something to worry about if you’ve got very large Facebook ad budgets. I’ve run multiple Comment-to-Messenger campaigns and have yet to generate enough comments in a short enough period of time for this to be an issue. 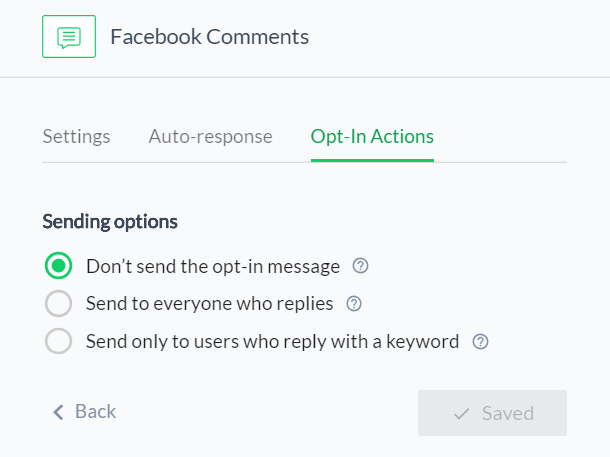 However, when using this Facebook comments growth tool I would recommend that you Don’t send the opt-in message. That is the default setting in ManyChat and sending an opt-in message alongside everything else can easily confuse things. The Facebook post you selected is now a live Comment-to-Messenger post. 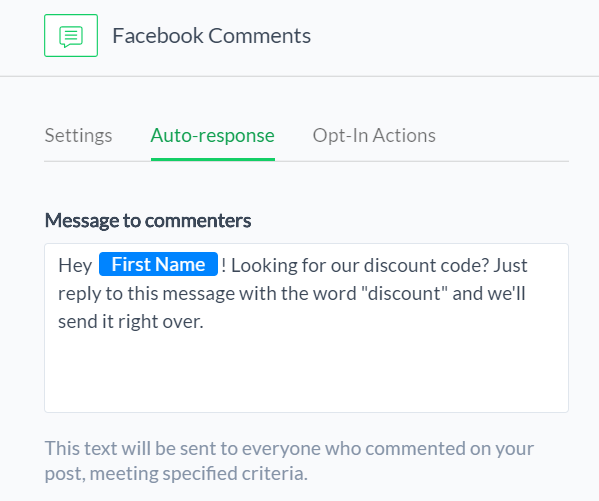 Before we move onto promoting it, we need to set up “discount” as a keyword, so that people are automatically sent a message with the discount code when they reply. You’ll see that there are already a few keywords that are automatically set up in your account. Select +New Rule. Now you should enter “discount” (or whatever keyword you’re using) next to Message is. After that, click on Create New Reply. Here you add the response that people will receive when they reply to your message with the keyword. Above you can see an example response that people would receive when they reply to the initial message with the word “discount”. Once you’ve done that, click Publish. From this list, select Subscribe to bot. It’s very important that you do not miss this step, otherwise people will not become Messenger subscribers when they reply with the keyword. And that’s it – everything’s ready for you to start building your Messenger subscriber list! To build a Messenger subscriber list you need to get people to message your Facebook page. 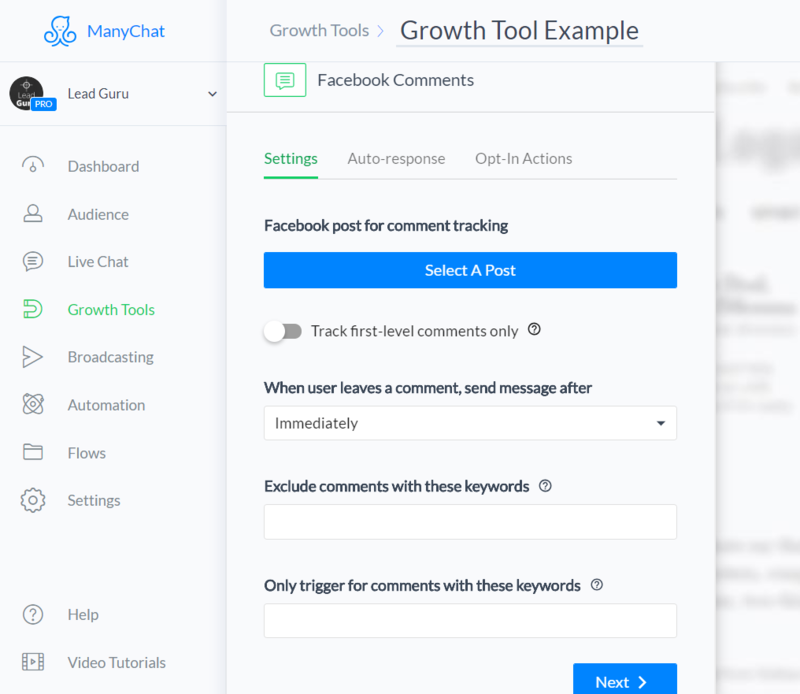 We’ve just been through how to do that with ManyChat’s growth tool called Facebook Comments. However, for this strategy to be really effective, you need to incentivize people to comment in the first place. I think it’s best to approach Messenger list building in a similar way to email list building. Using lead magnets to build an email list is a well-established practice. 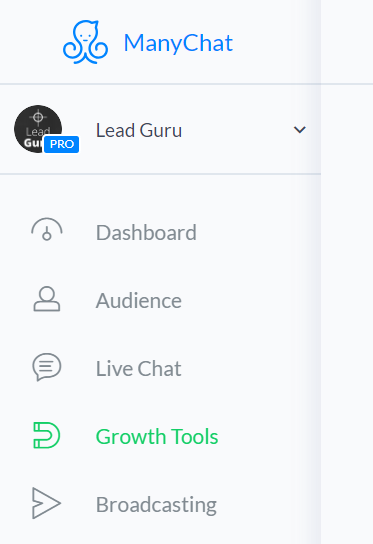 Why not use lead magnets to build a Messenger subscriber list as well? 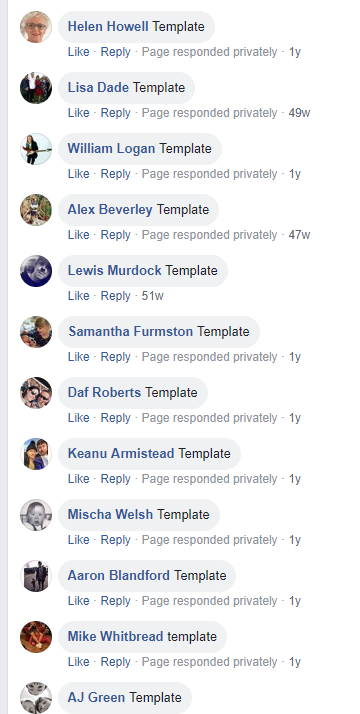 I created a lead magnet called the 5-Part Facebook Ad Template and used it to build my Messenger subscriber list with ManyChat’s Facebook Comments tool. Here’s the ad I used (apologies for the low production value, this was recorded before I invested in some decent gear!). 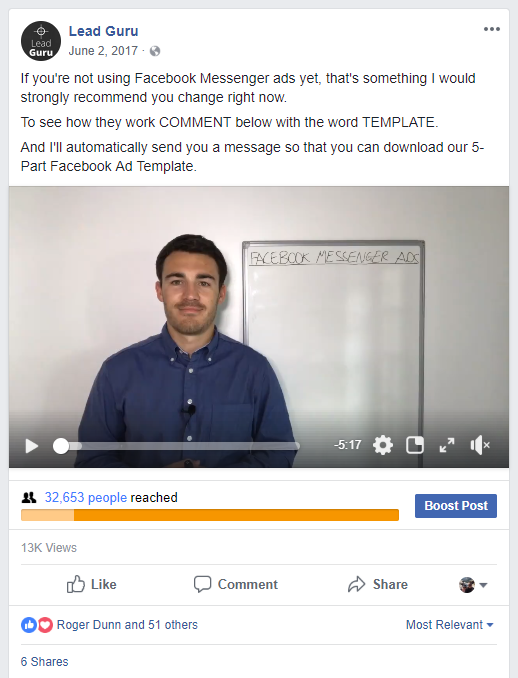 An added benefit of this strategy is that all the comments you generate give your ad a very high relevance score, which helps reduce the cost of your Facebook ad campaign. If you’re wondering who to start targeting with a Comment-to-Messenger campaign that uses a lead magnet, why not start with your warm audiences. 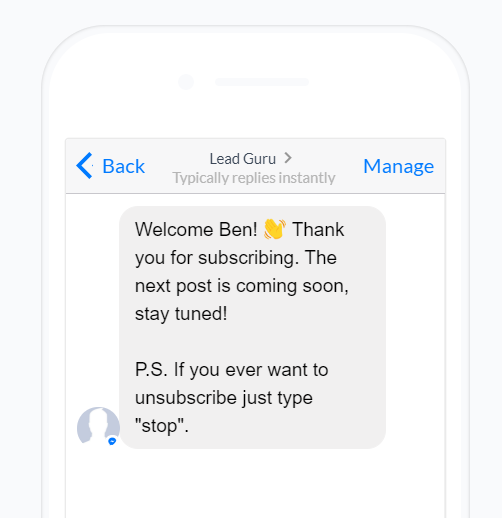 Offering lead magnets to existing customers can be a great way of reactivating them and adding them to your Messenger subscriber list. There’s also no reason why someone can’t be an email subscriber and a Messenger subscriber. Using this strategy to advertise to your email list can be very effective. Once you’ve exhausted your warm audiences, I would recommend that you target lookalike audiences with your Comment-to-Messenger campaigns. I’ve seen great results targeting lookalike audiences based off of both customer lists and email lists. Facebook Messenger marketing is going to be pivotal for many businesses going forward. Being able to communicate with your target market in a similar way to email, but on a platform that has much higher engagement levels, is a fantastic opportunity. And with open rates of up to 90% and click-through rates of about 20%, now is the time to build your Facebook Messenger subscriber list! Ben Heath is the CEO of London-based Facebook advertising agency Lead Guru. Alongside executing successful Facebook ad campaigns for clients, he also produces high-quality resources for business owners, marketers and entrepreneurs. Check out his blog for actionable Facebook advertising content.